These adorable butterflies make great scrapbooking embellishments, magnets, frame decorations, and of course earrings and hair clips! All you need are some papers strips, some simple tools, and patience. So give them a try today! This tutorial was originally featured on Red Ted Art. Click here to view the feature and see many other awesome craft projects! I am posting the tutorial here as well with some extra instructions. Let me know if you give the pattern a try. If you try it out and you post your results somewhere, leave a link and I’d love to take a look! The instructions will show and describe how to make one butterfly. 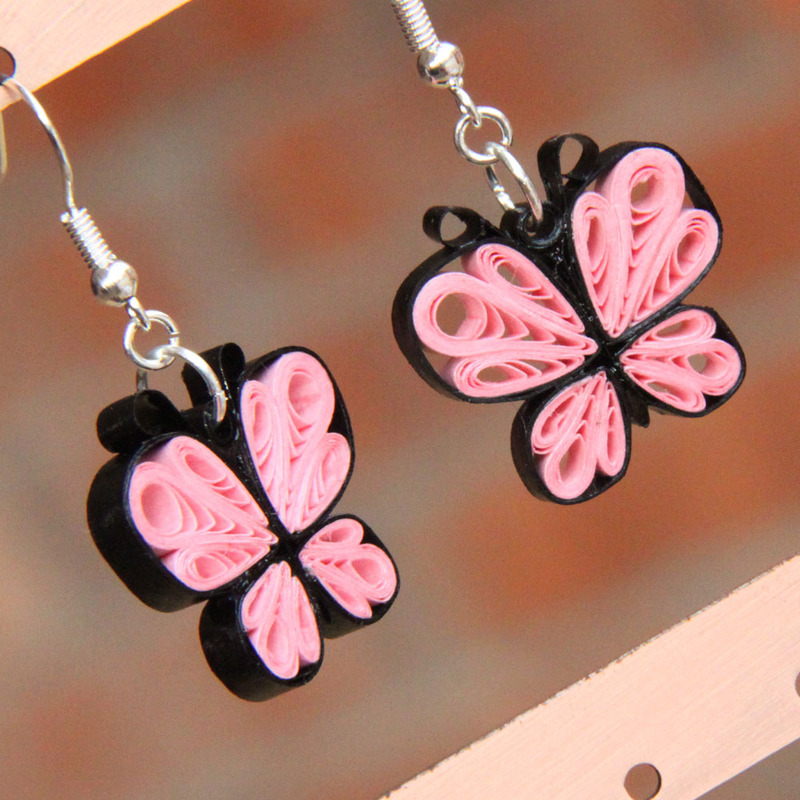 If you want to make a pair of earrings, make two butterflies. Twirl each strip of paper except for the long black piece. I use a template for the 6” and 3” pieces, but the 1 ½” strips are too small. If you don’t have a sizing template, just make sure each scroll is as close to the same size as possible. A little variance in sizing won’t matter, though, it’ll just make your butterfly more unique! Pinch each scroll into a teardrop shape by pinching one end as shown. The second picture below shows the positioning of the pieces for the butterfly wings. Glue together the pieces for each wing. Make sure you leave a tiny tip of the center piece sticking out as seen in the closeup photo on the left. This will make sure that your wings have points. Now it’s time to put the border on the wings to shape them up! Glue the end of the black strip to one side of a wing. Wrap it around the wing, pulling slightly so the pieces are nice and snug against each other. I like to wrap it around twice. You can do it just once for a thin border around each wing, or 3 or more times for a nice thick border. A 12 inch strip of paper will give you enough to go around each wing twice and have just enough left over for the body. You can see in the last photo how the border really brings the wing together and gives it shape. You want it snug, but don’t make it TOO tight or it will squish the center scroll. Use a small piece of the black strip for the body. I had just enough left from the 12” length to make the body for my butterfly. Fold the strip in half and glue the bottom together. Spread out the antennae. Glue the wings onto the body as shown below. If you have a corkboard, use pins to keep the wings in place while the butterfly dries. You can still do it without a board, but it’s easier to keep them in the right place if you use pins. Once the butterfly has dried, use the needle tool slipped underneath the butterfly to loosen any bits of stuck glue. Now you have the choice whether to leave the antennae straight or curl them. I like to leave them straight for hair clips, and either straight or curled for earrings. For greeting cards, frames, etc. I like to curl them, but straight is nice as well. To curl them, trim to desired length (not too short!) and curl using a needle tool as pictured. It’s a little tricky if the antennae is short, but can be done with a little patience. And you have a finished butterfly! This one is ready to use as any decoration or on a hairclip. If you want to use it for earrings or a pendant, continue to the next step to place a ring on the top! To make a ring, use a strip of black paper that is 1 ½” long. Roll it around the end of the slotted tool, but do NOT stick the paper INTO the slot. You want the middle of the ring to be nice and round. Glue the scroll closed without letting it expand, so it’s nice and tight. Place a drop of glue between the antennae and use a tweezers to put the ring in place. If you don’t have a tweezers you can use your fingers, but it’s easier with tweezers. Now your butterfly is ready to use as a pendant or earrings! But wait, do you want it to be water resistant and more sturdy? No problem! You can use almost any sealant you find at the craft store. I’ve tried a few and haven’t had any problems with any of them. One of my current favorites is PPA (perfect paper adhesive) since it can be used as both a glue AND a sealant. It’s my favorite glue for paper quilling! I also like using a liquid sealer as a base before a topcoat or glaze because it is easy to paint on and it soaks into the paper, making it stiff. I also use crystal coat glaze or Diamond Glaze when I want a nice shiny finish. I’ve tried many methods of applying sealant and the easiest I’ve found is to use a very small short paintbrush to apply the sealant. Paint a thin layer on one side and let it dry. Turn it over and paint the second side and let it dry again. Lastly paint the edges and dab the paintbrush into all the crevices to make sure the whole thing is coated. The reason you need to wait until it’s dry between layers is so that the sealant doesn’t cause the coils in the shapes to come open. Not all sealants will have that effect, but most will. In the second photo you’ll notice the whiteness of the sealant (it is PPA). As it’s drying it is soaked into the paper and it dries to a totally clear and matte finish. If you would like some more information about using sealant and to see some of the different sealants, see this post and also this one. Now it’s time to put your butterfly to use! To use it as a pendant, just put on a large jumpring. To make into earrings you’ll need two earwires and four jumprings. I like to use two very small (3-4mm) and two larger (5-6mm). Use the larger jumpring to hook onto the ring that you added to the butterfly. Use the smaller jumpring to attach the larger ring to the earwire. And there you go! Want to use your butterflies for hair clips? Click here to view my post on how to attach your paper quilled designs to hair clips. For butterfly hair clips I don’t do curls for the antennas and you don’t need to put a ring between the antennae. The blue butterflies below have crystal coat glaze on them, and the purple/pink have several layers of sealant. You can see that if you are going for a shiny look you should use the crystal coat glaze! It also makes them a bit more sturdy. I hope you have enjoyed this tutorial! If you have any questions or comments, please feel free to leave a comment! If you have suggestions for future tutorials let me know that as well! *This post contains affiliate links. If you purchase products through these links I get a small percentage. I only link to products that I believe in and love to use myself. Thank you for supporting my blog! Oh good, glad to be of help! Enjoy, and if you post your butterflies on your site, feel free to leave a link here, I’d love to see them! I am enjoying your tutorials very much, I just found your site and very happy I did. You have already answered some of the things I am having trouble with. I am trying to a tutorial on how to make a certain leaf and petal with my qilling comb. I can’t seem to figure out how to start the paper, it ends up with small loops you fold and form into the leaf or petal. I will keep looking. Thank you again for your site. Thank you for your comment, Kathy 🙂 I’m glad some of my tutorials have helped. I know the type of leaf you are talking about. I’ll put that on my list of tutorials to make for the future! hey,your tutorials are incredible.i love them very much. when i have a free time ,i always tries to make them.oooooh,ther so cuttttttttte.thank you for giving us a oppurtunity to learn these things!!!!!!!!!! you’re welcome 🙂 thanks for leaving a comment!